There is a new, conservative treatment for select patients that may arrest or stop decay in its tracks. It’s called Silver Diamine Flouride or SDF. Its use has been documented for years in Japan and Australia, with significant results! The product, SDF, has gained approval in the United States for treatment of hyper-sensitive teeth in adults. But newer studies have shown that it can also stop the progression of smaller cavities. It can also be used to prevent the start of cavities as a brush-on product, in a similar way that flouride varnishes are used today. This product has already made its way into many dental offices across the country, as well as Medicaid patients and dental schools, as an adjunct to other preventive care measures. The ability to” paint” this product on in about 30 seconds with no noise, drill and less apprehension, is better, faster and cheaper. And less traumatic for the kids! Please ask if this treatment option for your younger children, will work for their situation. The main downside to this product it that it will stain decay to a black color. This may not be an issue in the back of the mouth, and it may not be a problem in the front teeth, but you need to be aware. Until its covered more by insurances, patients will have to pay for the service, but it certainly is much less costly than having a filling done. So please bring this up at you next visit, discuss the pros and cons and decide if its right for you and your family. 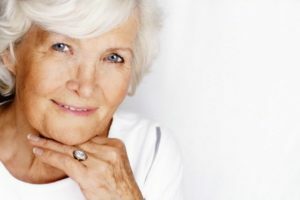 When considering your options for replacing a lost tooth/teeth, or when your dentures are not as stable as you would like them to be, when you have been told there are no more options to care for teeth that are beyond normal repair, the conversation about implants, to help arrive at solutions that are strong and permanent, is a discussion Dr Jaeger can have with you. Come in for a comprehensive exam and evaluation to see if this technology can work for you! Advances in implant care and use has come a long way. There are many situations in oral care where an implant can replace a lost tooth due to trauma, extraction or for previously restored teeth that may not be adequate for potential bridgework. They are a permanent solution that can support single or multiple restorations, as well as support or retain loose fitting dentures. There needs to be adequate conversation about your overall health to determine if implants are a treatment option. This does play a major role in outcome of care! Please call if you have any questions, so we may schedule time just for you. During this presentation, all the options available within the dental technologies currently being used, can be discussed. A beautiful smile can brighten a room, improve your confidence and boost your self-esteem! It can give you a positive outlook in all aspects of your life. Have you ever wondered what could be done to improve your smile or overall dental health? The staff and Doctor Jaeger, at Creekbridge Dental, can give you all the answers you are looking for and maybe point out aspects or treatments for your oral health and well being, that you have not considered. Esthetic enhancements to your smile maybe as simple as contouring your teeth. It may be cosmetic bleaching, to brighten your teeth. And it may be discussions about veneers or crowns that can strengthen and reshape your smile to be something you’ve always dreamed of. Whatever it may be, we are hear to help you in that journey! With all the treatments available, there will be something you can do to improve the function and esthetics that you desire. Please don’t hesitate to call and start that journey today. Whatever your heart desires , the possabilities and varied treatment options , can help us find you that perfect smile! Whenever you visit the dentist,the people caring for you and rendering treatment will probably suggest that in addition to your 2-3 daily brushings, that you also clean between your teeth daily as well. Tools at your disposal are toothpicks, floss and waterpicks. They can come in many different forms but will all do the same job if used correctly. If you think about all the spaces that you need to care for in your mouth, your tongue, cheeks and numerous surfaces of the teeth, your tooth brush can really only touch 3/5 surfaces, or about 60%. Does it sound like leaving 40% of the food and plaque in your mouth daily can be anything but good? Yes! Yuck! You need to clear the plaque from between your teeth as well. There are two great reasons to do this every day: first you can really help prevent cavities from starting in a very difficult space and second, your gums will be so much healthier. It can also provide you with fresher breath. So please do your homework, and spend more time with your toothbrush AND your floss! Everyone at Creekbridge Dental would be happy to give instruction and educate you personally on the best techniques for your oral care. Give us a call! There seems to be a link between poor oral health and age-related mental decline, researchers say. However, the researchers emphasized there is not enough evidence to prove a direct link between oral health and thinking (“cognitive”) abilities. Some of the studies found that oral health indicators — such as the number of teeth, the number of cavities and the presence of gum disease — was associated with a higher risk of mental decline or dementia, while other studies did not find any association.